Sailing is all about waiting for the right weather. 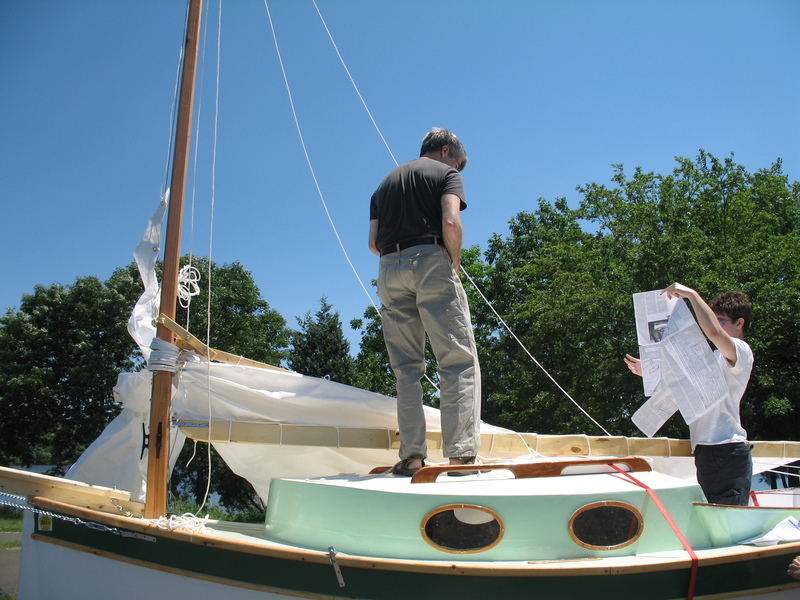 In theory, the transition from builder to sailor is straightforward: I start building; I finish building; I go sailing. But I am realizing that the building never really ends: A day of sailing leads to a few days of tinkering and improving. For every hour under sail, I spend a couple of hours back in the garage. That’s what happened after my first sail, anyway. Immediately after returning from our inaugural sail, I made a long list of necessary fixes and needed improvements. Over the next two weeks, I focused on the most urgent upgrades. Sturdier chains and no "quick links" strengthened my bowsprit. First, I removed all of the “quick links” I used to connect the bowsprit chains to eyebolts on the hull. They were recommended by my boat’s designer, but during our first sail, one broke outright and two others started to pull apart. Clearly, they were not up to the strain. 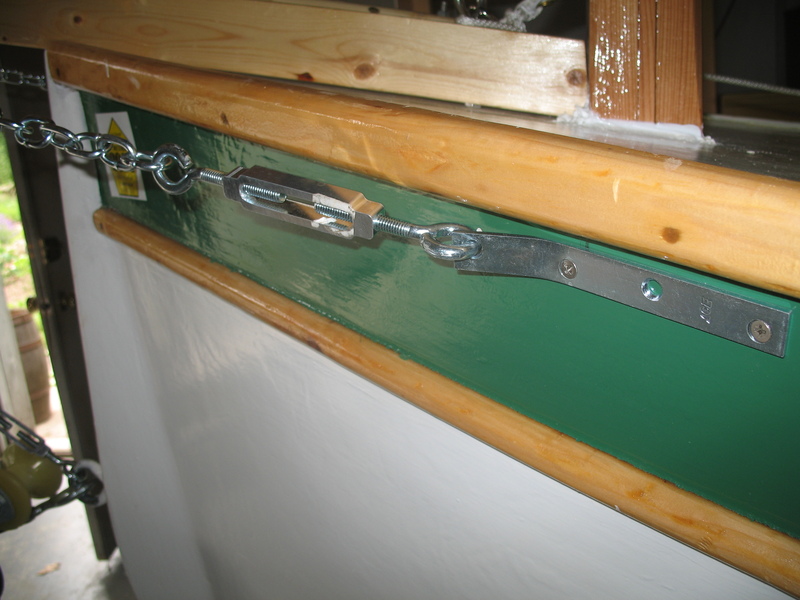 I bought larger chain and connected it directly to the eyebolts on the keel and chainplate straps on the hull (simply by prying open the turnbuckle eyebolts, inserting a chain link, and then squeezing the eyebolt shut). Next, I tackled the most serious problem we faced the first time out. In mid-lake, while sailing under a stiff wind, the turnbuckle holding my starboard stay unwound itself and the stay flew away from the hull. This was a potential catastrophe; it’s common for masts to break when stays fail. 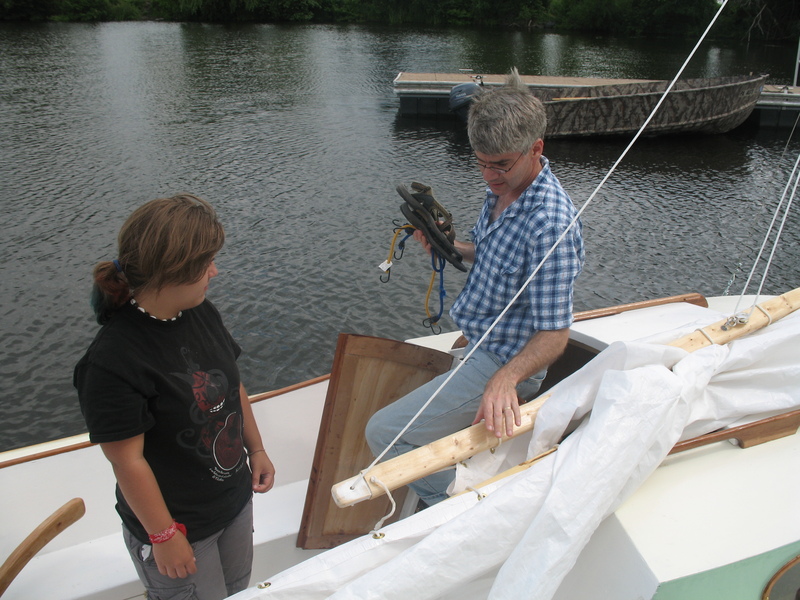 Fortunately, were able to drop the sail in time and reattach the turnbuckle. Back home, I considered buying larger turnbuckles, but those intended for boats were remarkably expensive ($40 each from one boat supply company). So I decided to simply lengthen the stays slightly so that I could turn the screw more fully into the turnbuckle. I hoped that this would prevent unwinding or, at least, give me time to see it happening. Finally, I made several changes and improvements to my lines. Most significantly, I removed the plastic hoops used to hold the mainsail to the mast. They were bulky, cut into my mast, and didn’t fit over the hinges at my tabernacle. After extensive research I chose to instead lace the sail to the mast using a “forth and back” pattern that, I read, minimized binding. This link shows how it works. Once finished, I was ready for my second sail, but the weather was not cooperating. Day after day, the national weather service predicted thunderstorms. Meanwhile, these overcast days were weirdly still. I never used to think about wind, but now I anxiously stared at treetops, looking for the taletale shimmer of leaves. But even the flimsiest branches were as lifeless as a painting. Was this normal? It struck me as unnatural. Finally, the threat of storms diminished and light winds were predicted. 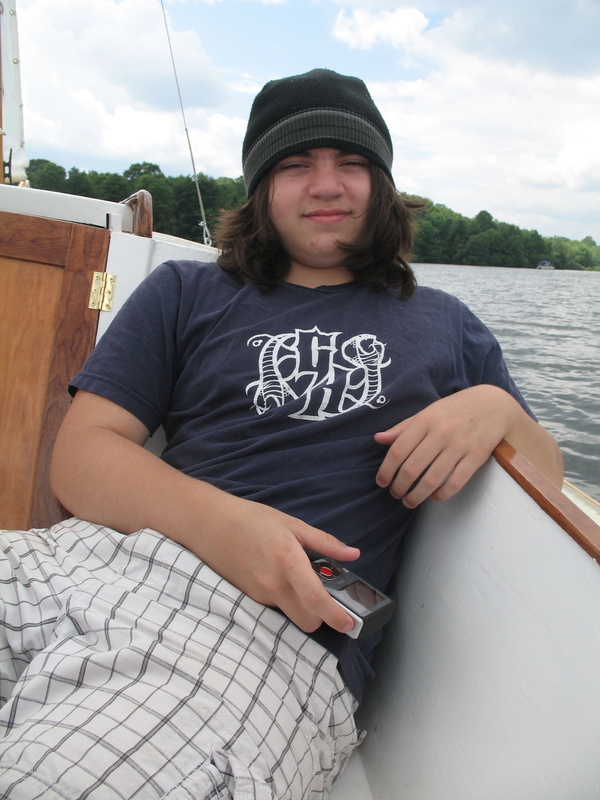 More importantly, it was also my son’s eighteenth birthday and, coincidentally, the first day of his two day sailing course at the Lake Nockamixon Sailing School. Do you remember my oldest son? He’s the one who started building a small sailboat about a year ago. Since then, his interest in sailing has turned into an obsession that now exceeds my own. Young people have the wonderful opportunity to live life more intensely than older people. His plan is to take a “gap year” between high school and college, buy a used cruising sailboat, sail down the Intracoastal and, possibly, to the Bahamas. He will do this with a friend and finance the whole adventure with their combined savings. Does this sound risky and financially irresponsible? Maybe so, but if not now, then when? When I’m not worrying for his safety, I’m jealous—and filled with self recrimination that I didn’t do this sort of thing when I was younger. To win our blessing (and a small financial contribution), we asked him to complete a variety of skill-building experiences. One was to complete a formal sailing class. That’s what brought him to the Nockamixon Sailing School and their ASA certified “basic keelboat sailing course.” So on the appointed day, we drove to the lake with our Pocket Cruiser in tow. Avery would board the school’s 24-foot Catalina with four other students, while I would continue my program of self study and sail our boat with the assistance of my two other children. The view from the cockpit. It was a perfect day. By the time we arrived, the sky was a scenic mix of blue and billowing clouds, while the lake surface was pleasantly rippled by light winds. I left Avery with Captain Tom and the other students, a friendly group of young men, most in their 20’s and early 30’s. Back at our boat, we quickly raised the mast (avoiding the tangles and confusion of our initial launch) and, with growing confidence, backed the boat into the water. While our first launching was marked by an embarrassing drift into a stone jetty, we now managed to raise the sail and get underway with a measure of grace. We sailed upwind, tacking repeatedly from shore to shore as we slowly made progress down the long, narrow lake. Winds were light, but the sails rarely went slack. Both Sophie and Matthew took turns at the tiller and proved to be natural sailors. Not worrying about imminant disaster, we were able to enjoy each other’s company and exchange pleasantries with passing boats. I started to realize that several sailors were going out of their way to sail next to us so they could offer complements and ask questions. “What kind of boat is that?” they would inevitably shout across the water. My answers became practiced. “Nice boat,” they would conclude as they waved and sailed away. Without question, we were the slowest sailboat on the water, but we were also the prettiest. After a couple of hours, the sailing school’s boat came into view and I caught of glimpse of Avery at the helm. He looked confident. We waved enthusiastically, and he gave a curt wave back before leaving us in his wake. I didn’t mind. He was 18 and living his own life. So far, all of my fixes and improvements were working. My chains were holding and my stays were staying. I was especially proud of my “forth and back” lacing. The main sail rose easily up the mast, held tightly and had a salty, uncluttered look. But we had one new challenge ahead of us: anchoring. 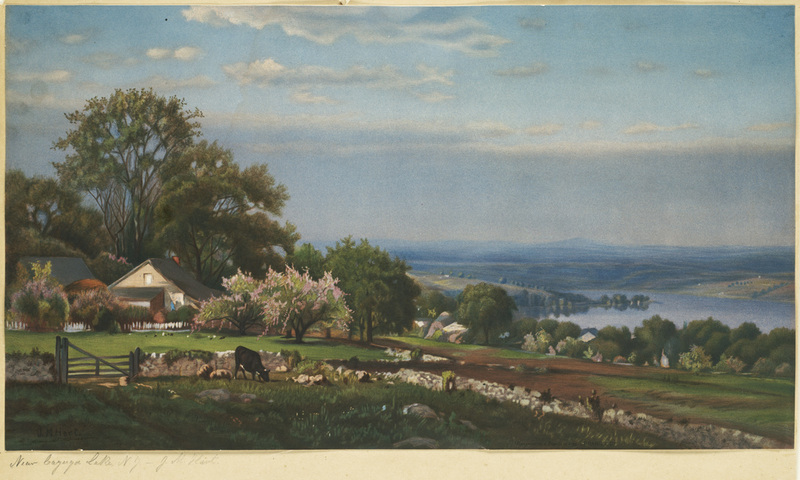 During our first sail, I realized that sailing is constant work and that it’s not possible to, say, enjoy a picnic lunch while holding the tiller in one hand and the mainsheet in the other, so I decided that I needed an anchor so we could find a quit cove and pass an idle hour with good food and a book. My "Chinese" anchor. It worked--but not for the right reasons. Small anchors are cheap, but I’m cheaper still, so I decided to build one. I found plans for two online. One was a simple “fill a milk jug with cement” affair. I happened to have both a milk jug and a bag of cement, so I made one of those. But the other anchor really captured my imagination. It was based on a traditional Chinese design and looked like a giant fishhook. 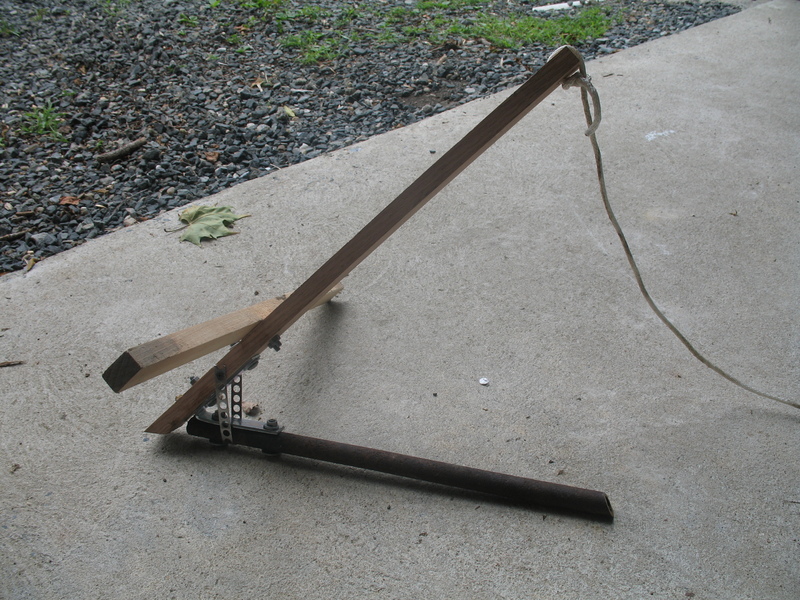 Most of it is made from wood, but the actual “hook” is simply a length of metal pipe. In theory, the anchor drops, metal part first, into the lake bottom, where it catches and holds. I was intrigued by this simple technology and happened to have an old pipe and most of the needed hardware. An hour of work got the job done and I took both aboard the boat. If one didn’t work, I planned to use the other. We located a promising anchorage about 50 feet from shore. 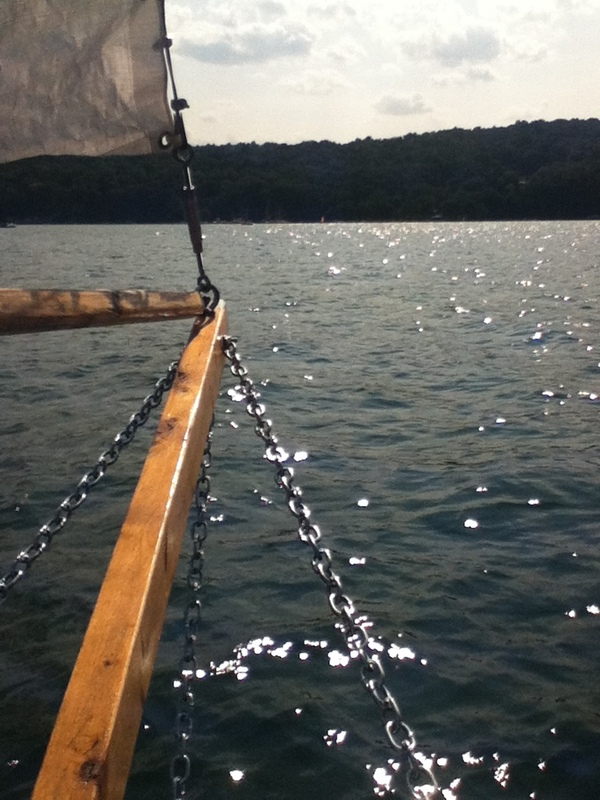 With Matthew at the tiller, I went forward, lowered the sail and dropped my “Chinese anchor” into the water. It went down about ten feet before the line went slack. I played out the rope (which is called “rode” when it’s attached to an anchor for some reason). I could tell that it was dragging and not really catching. But then, after letting out most of my line, it went taut. I yanked, and it didn’t move. Success! We brought out our sandwiches, opened sodas (for the kids) and coconut water (for me). After lunch it was time to get underway. Matthew went back to the tiller and I started yanking at the anchor. The boat moved forward as I raised the line until we were right over the anchor and the line went straight down. I pulled; nothing happened. I pulled harder; nothing happened. I wrapped the line around my hand and heaved with all my might. Slowly, the line came out the water. Finally, I saw something at the surface: it wasn’t my anchor; it was a giant…something–a large latticed structure covered in grasses and slime. I couldn’t even tell if it was metal or wood. In the middle of it all was my anchor, its hook caught in the three-inch thick latticework. My children were appalled. “Is it a dead guy?” Matthew asked. I gingerly slipped off the anchor and the structure slowly sank out of view. So I know my anchor works—when it gets hooked on lake bottom debris. Under normal conditions, I am less confident. We had been on the water for nearly three hours; we still had three hours before Avery’s class ended. We put on more sunscreen and continued our tacks upwind, accepting more complements, gaining occasional sightings of the sailing school boat. To get away from the sun, the kids rested in the cabin. Eventually, we decided to turn back toward the marina, explore the upper reaches of the lake before returning home. Me relaxing. Sailing is easy when you have a good crew. It was during the final hour of sailing that we encountered our only difficulties. The main problem was that I blundered into a boat race. In the distance I had noticed a knot of sailboats, but not until I was amid the group did I realize that they were following the same circular course and being observed by judges on a pontoon boat. This was all new to me and my understanding dawned slowly. Nobody seemed to care that we crashing their race and we were not the only non-racers in this part of the lake, but I felt like a dope and tried to stay out of their way by heading over to the far western shore. However, returning to the marina required tacking back upwind, which was hard to do when I had to stay out of the middle of the lake. To add to our confusion, the wind picked up and started shifting directions unpredictably. One of the racing boats capsized and had trouble righting itself, which was sobering to watch. After nearly five hours of perfect sailing, we were caught in a maelstrom of gusting, unpredictable winds and racing, capsizing sailboats. Six hours later we return safely to harbor. Before long, the winds eased and the race ended. Relieved, we plotted our course back to the boat launch. By the time we had the boat on the trailer and all our equipment back in the car, Avery came sauntering up. He looked sunburned but happy. A wonderful time was had by all. Yet, with a few days’ reflection, what I most remember was the simple thrill of seeing the boat float and actually move forward under sail. Sitting at the tiller, feeling the tug of the water on the rudder, hearing the rustle of sails above, watching the bow point to a distant shore, and knowing that every bit was built by my hands, was deeply, almost indescribably satisfying. The four hours passed so quickly, we all (my crew and I) swore it felt like an hour at most. It was, we all agreed, very, very fun. It’s amazing how quickly old worries and preoccupations disappeared. Once in the water, I no longer worried about leaking or sinking. And I completely forgot to worry about my choice of glues or the durability of my hardware store paint. When the boat slid off the trailer and bobbed in the water, these fears evaporated. Instead, I found myself simply reveling in the experience of being on my boat, working the lines and bringing the craft to life. “Bringing the craft to life:” Yes, that statement helps capture the experience of sailing my boat. While it’s possible to admire the boat’s lines and color scheme when it is sitting in a garage, it feels essentially lifeless and graceless when sitting under florescent lights and covered in a thin film of dust. But on the water and under sail, the boat gleamed and the sails breathed. The joy was seeing it come alive. Our first hurdle was to fix tangled halyard lines. My son is helping me consult the instructions. Still working on the lines. There's nearly 300 feet of rope on this boat! Finally fixed. it took us over half an hour to get the boat ready for launching. Unfortunately, we don't have any still photos of the launching or sailing. Check out the Youtube video (the link is in my previous "Launched!" 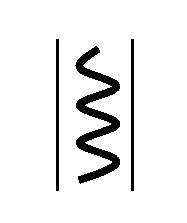 post). We chose a day with a careful eye on the weather. A pleasant day was promised—sunny and in the 70s. Wind was my only concern; it was blowing around 15 miles and hour and gusting to over 20, according to radio. That’s not tornado weather by any means and, for most sailors, it represents nearly ideal conditions. But for my launch, I wished for something more benign. I didn’t want to tax my boat or my crew on our inaugural sail. But I wasn’t going to wait for a less windy day; even worse would be a day without any wind. Launching on a still lake would be anticlimactic, to say the least. 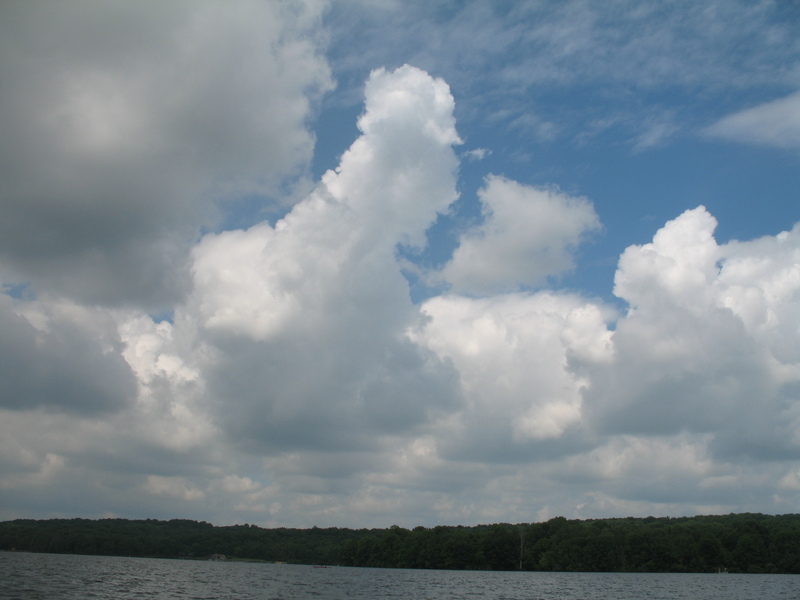 We chose to launch at Lake Nockamixon, a rather large body of water in eastern Pennsylvania. It allows motorboats, but seems most popular with sailors. Nearly all of the boats in its 600-berth state park marina are either sailboats or innocuous pontoon boats. 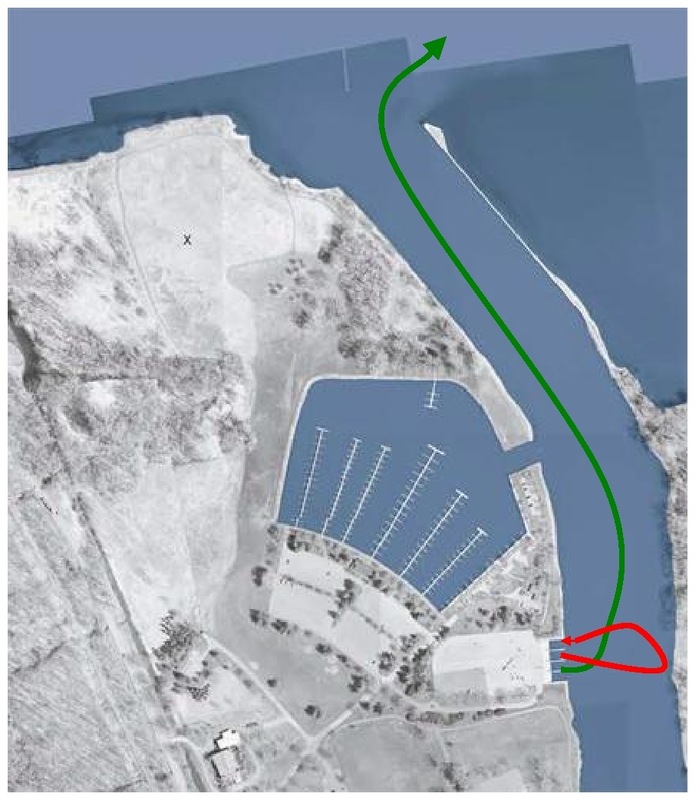 In preparation, I had carefully plotted the route to the marina (I was almost as worried about trailering the boat as I was about launching it) and even zoomed in on the boat launch with Google Earth so I could mentally rehearse strategies for backing the trailer into the water. I didn’t want to look like a hapless first timer, jackknifing my trailer and dumping the boat sideways. My old Subaru cooperated by not breaking down or balking at the weight and we arrived early afternoon. I proudly drove past the sign “trailers only beyond this point” and slid into the parking area, where several other sailboats were being prepared for launching. Their owners seemed skilled and purposeful. 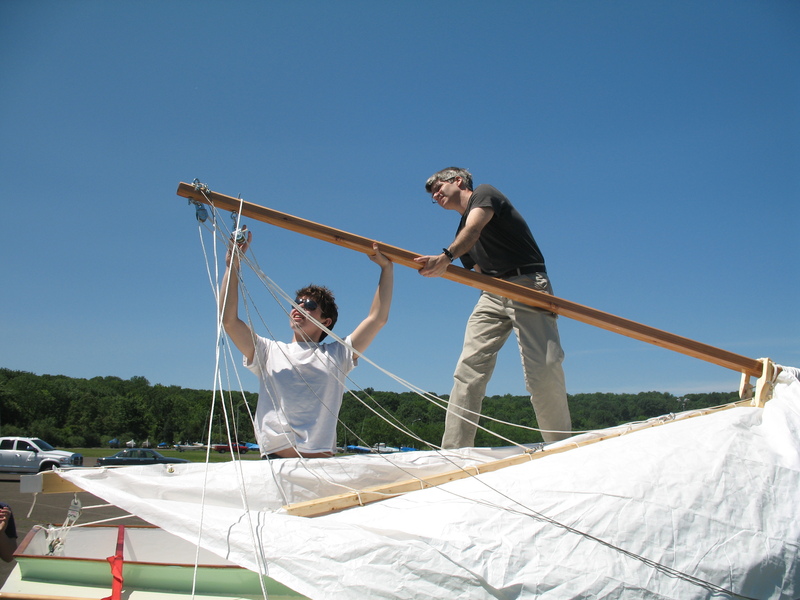 Affecting what I hoped was an equally confident manner, I directed my wife and two teenage boys and began to raise the mast and attach the stays. Decorum was lost, however, when we realized that our halyard lines were hopelessly tangled. The sail came back down and we spent several minutes trying to remember if the line went through the double pulley and then through the single pulley—or the reverse. I actually brought along my boat building instructions and (to my quiet shame) surreptitiously consulted the rigging chart to set it right. My wife threatened to say loudly, “Do you need the instructions, honey?” Trying to be nonchalant, we untangled the mess. Now it was show time. There were four areas to launch boats; three were occupied. The only available spot was downwind and near a jetty. I sensed trouble, but plowed ahead. I drove the car down to the launch and backed up to the water. The night before I read about backing a trailer in a great little book called The Complete Sailor. The trick, my book said, is to place my hand on the bottom of the wheel and move it in the direction that I wanted the trailer to go. This helps novices avoid the tendency to point the car in the wrong direction. With this helpful guide, I avoided excessive embarrassment. Pretty soon, the trailer was going underwater and the stern was getting wet. With much help and advice from my family, the boat was unhitched and pushed into the water. I was just about to shout for joy when, suddenly, I saw the starboard stay go slack. A moment of confusion was immediately followed by intimations of disaster until my oldest son realized that the culprit was a “quick link” holding one of the bowsprit chains to a turnbuckle. The strain of moving the boat had pulled the relatively weak coupling apart. The bowsprit loosened, releasing tension in the stays. The problem was small, but the implications were serious. If I couldn’t reattach the chain to the hull, I couldn’t sail. Fortunately, I had the foresight (or lack of confidence in my building skills) to bring my toolbox. In fact, before leaving home I told my wife that I had packed enough tools to build a house. So with the help of a Vice-Grip, hammer, and countersink (don’t make me explain this combination of tools) I was eventually able to squeeze my chain directly into a turnbuckle. I was relieved, but humbled. The boat was floating, but I had to overcome a mechanical problem even before I had set foot on deck. 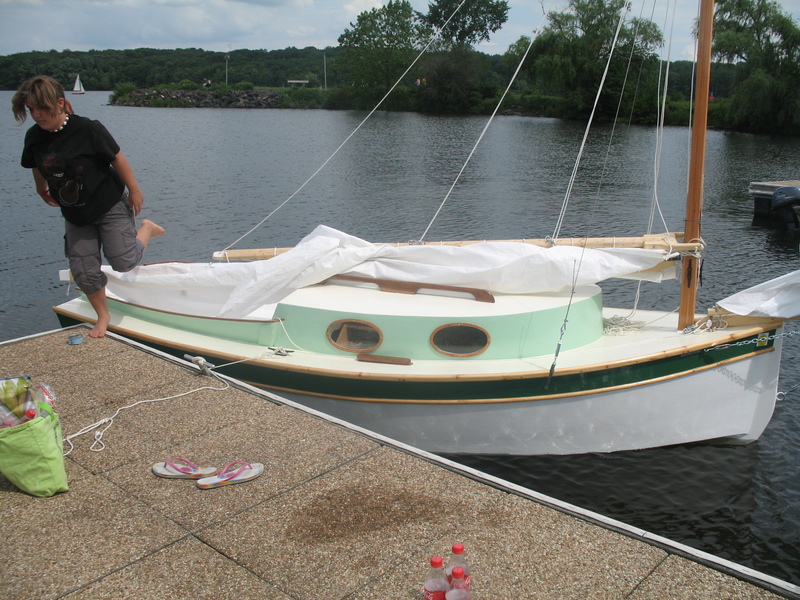 Next came the hard part—getting aboard, raising the sail and getting away from the dock. 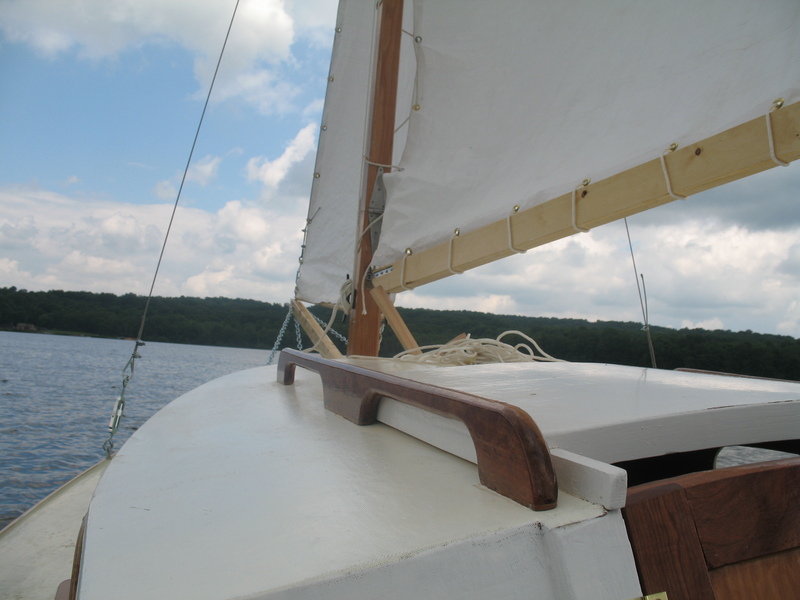 Here’s what happened: I decided to raise the jib but not the mainsail before getting underway. We all got aboard and started drifting away from the dock. I went forward to raise the main sail, but before I made much progress, we were close to the rocky jetty. I shifted strategies and grabbed a paddle, but it was too little, too late. At the last minute I jumped overboard and, standing in water up to my waist, pushed the boat away from the shore. Did I mention that it was a pleasant day and the jetty was crowded with sightseers? “Well, he needs to get his boat away from the rocks,” I heard one older lady explain to a wide-eyed grandchild. Safely away from land, I was finally able to raise the mast. Immediately, the wind grabbed hold and we shot out to the middle of the lake. 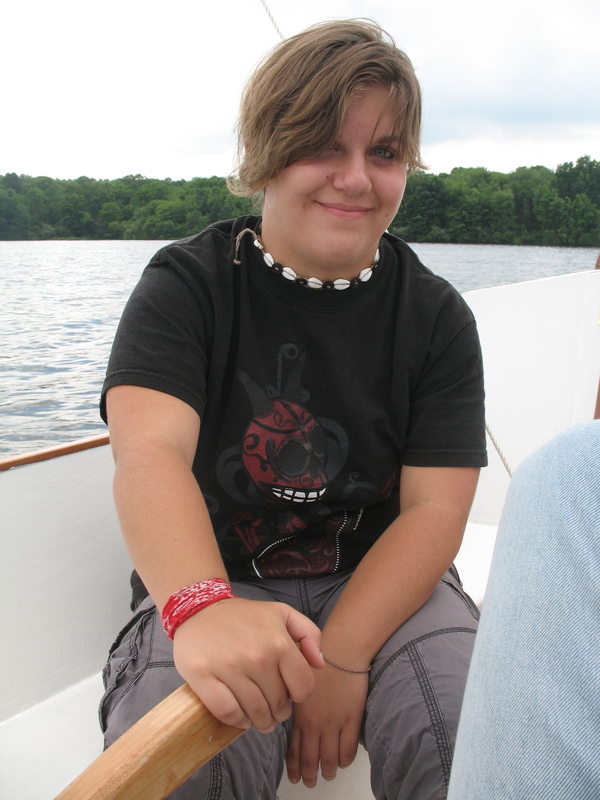 My oldest son was at the tiller, grinning like the Cheshire Cat; this, he felt, was what sailing was all about. My wife was not so sure. She had fantasies of dangling her arm in the water while reading a book, not holding on for dear life. In truth, I was a bit nervous, too. There was so much that I didn’t know about this boat. How far can it heal? How fast can it go? It’s not a large boat, but it’s much larger than a Sunfish. And I simply didn’t know what to expect from a flat bottomed craft. We waffled upwind as I fought competing urges to race ahead and ease off for safety. Still, this was, perhaps, the best part of the afternoon. We were making good progress and I always felt more comfortable going upwind. We tacked a couple of times and nobody received a concussion. How much time passed? My son guessed fifteen minutes; my watch said an hour. I looked back and realized that the marina was a surprisingly far away. We decided to turn down wind and head back. 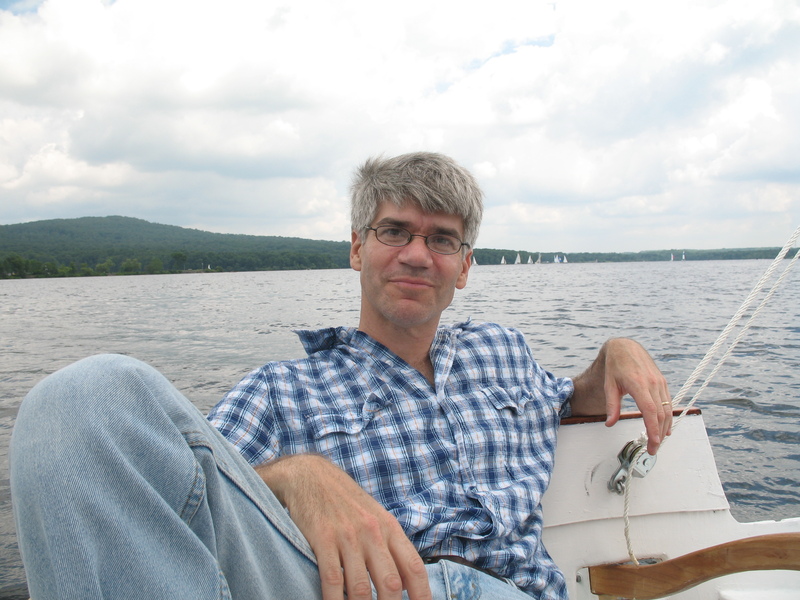 As I have written in before, I grew up sailing a small boat on a small lake. As a child, I didn’t have any formal training as a sailor. I felt competent, but I had no awareness of sailing terms or concepts. Sometimes I needed to let out the sail; sometimes I found it better to keep it close to my side. I understood that the boom would swing from one side to the other when I turned. But I had no concept of “close hauled” or “broad reach” sailing. I know that it was sometimes hard to make reliable turns, but I didn’t know why. In hindsight, I realize that, as a boy, I tended to take the easy route and muddle through the hard parts of sailing. This meant that I looked for opportunities to sail across the wind (reaching) or slightly upwind (close hauled, I think it’s called), which gave me the most sense of control and the easiest tacks. But I struggled with downwind sailing. Only later did I learn from my books that downwind sailing really is harder. It’s harder to judge winds, make turns, and avoid jibing—a sudden and unintended swing of the boom from one side of the boat to the other. So as we turned and headed downwind toward the marina, my Achilles heal was once again revealed. Gusts, shifting winds, and a disoriented captain meant that we bobbed and weaved about, catching wind one moment, stalling the next, and making quick turns to avoid jibes when they threatened. “Where’s the wind?” I kept asking my family. Three hands would point in three slightly different directions. Inelegantly, we made our way back down the lake, but just as I felt that we were finding our sea legs, we faced our next major challenge. Sitting at the tiller, I saw the starboard stay fly away from the hull and hang limp in the air. I looked at the mast saw it bending about 10 degrees to the left, straining against the two hinges holding it to the tabernacle. Without the support provided by the vital length of wire, the mast would almost certainly break. 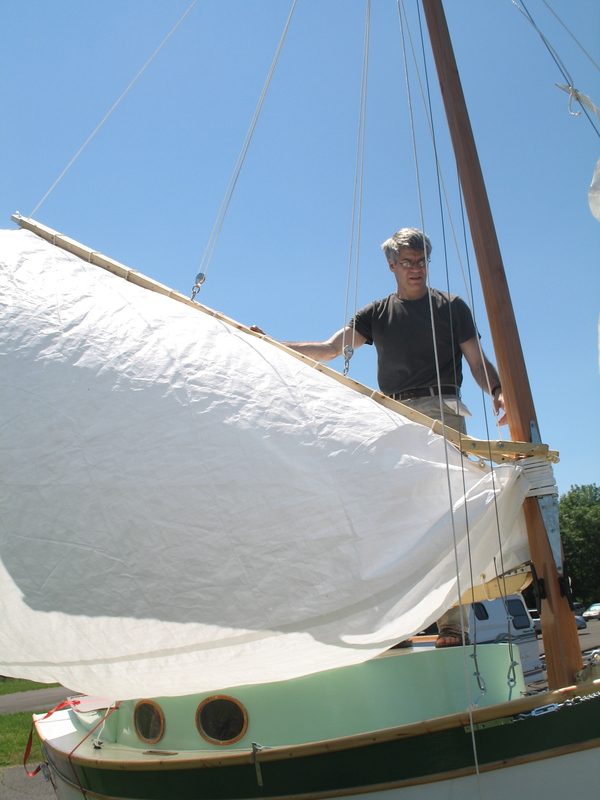 I handed the tiller to my son and clamored forward to lower the sail. My first thought was to reduce tension on the mast and, if necessary, sail home with the jib alone. But once I had the sail down and could inspect the stay I realized that nothing was broken; the turnbuckle simply unscrewed itself (how could that happen? I kept thinking). But this gave me hope. If we could straighten the sail, I might be able to screw the turnbucke back in place. Our plan was simple. I told my son to turn the boat to further reduce tension on the starboard side and to have my other son push the mast with all his might. I grabbed the stay and turnbuckle, willing them to come together. “Almost there!” I yelled. “Try again!” After a minute of frantic and frustrated effort, I gained just enough slack to bring the two parts back together. We were saved. Exhausted and almost giddy, I decided that we should take a break. We kept the mainsail down while I crawled into the cabin (for the first time while under sail) to lie down and eat one of my wife’s homemade empanadas. I felt a great rush of happiness and affection for our boat, despite the glitches. “I love my boat!” I enthused, my mouth full of food. By the time I finished my dinner and came out of the cabin, the winds had died and we were drifting toward shore. More frantic work ensued as we raised the sail and pointed the boat back out toward open water. Emboldened by our ability to overcome nearly every possible catastrophe, we sailed past the marina before deciding to head back upwind and toward home. For me, this was my opportunity redeem myself. After a disastrous departure, I was determined to return with skill and grace. 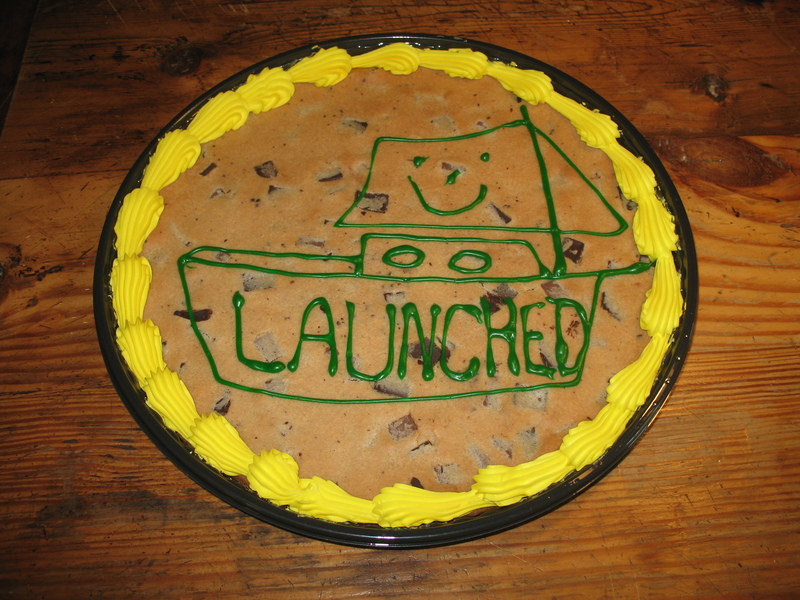 A couple of days later, fellow boat builder David Heineman dropped by with this giant hand decorated celebratory cookie. Boat builders are very nice people. So feeling the pressure on all fronts, I bided my time before turning back toward the launch. “We’ll head for the one the middle,” I said, pointing my boat at the center dock. We were moving fast, but I could tell that we were slipping downwind—leeway, I believe it’s called. I adjusted the tiller and pointed the boat about 15 degrees upwind. “Look!” I said to my family. “Can you see how we need to go sideways in order to sail straight toward the dock?” Yes, they could all see it. Pretty cool. Closer…closer. Please, god, don’t blow it. And at the last possible second, I straightened the tiller and we slid with perfect precision alongside the dock. I jumped out and looked around. Nobody was watching.